Congratulations to The Edwards family of Moore, Oklahoma and trainer Mary Shappee on the purchase of SSLLC Something Wicked. 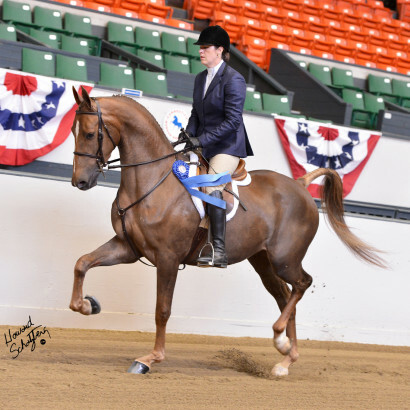 ‘Diva’ will be the new mount for their daughter Savannah in the Hunter Pleasure division. Congratulations to the Graeff family of Washington, DC on their purchase of SSLLC Outrajus. ‘Will’ is to remain under the direction of Amanda DuPont of Windward Farm. We look forward to watching this wonderful gelding’s career unfold with this dynamic team! Congratulations to the Robinson family of Maxwell, California on their purchase of SSLLC Addiction and SSLLC Ready To Wear. Carollyn and her son Mitch have big plans for both of these lovely fillies and we are excited to see them blossom under Mitch’s tutelage! And finally Congratulations to the Hill family of Middleport, NY on the acquisition of SSLLC Sudden Impact. ‘Noah’ is the family’s first horse purchased for their daughter Corinne to be shown in the Walk-Trot Hunt Seat division. This adorable pair will be under the guidance of Josh and Olivia Piatt of Champion Hill Farm. Welcome to the Morgan family- we look forward to cheering you on!